Class of 2010: The first NMIT class in 3d immersive environments. The Nelson Marlborough Institute of Technology has successfully launched and is into the fourth week of an online course on multi-user three dimensional virtual environments (MUVEs) and their relationships to other multi-user technologies. The 16 students, enrolled in the course (A&M624, Immersive 3D Environments), based on the NMIT Second Life islands of Koru and Kowhai, are being tutored on-campus by Dr Clare Atkins (SL: Arwenna Stardust) and online by former SLENZ developer and New Zealand’s most experienced virtual world builder, Aaron Griffiths (SL: Isa Goodman). The course has been designed to develop knowledge and understanding of using current generation commercial software as well as providing in-depth knowledge of specialised processes, techniques and media, according to Dr Atkins. While the course includes explorations of other virtual environments, most of the classes focus on the use of Second Life. The course will take 60 hours class time, with at least half the classes in a virtual world, mainly Second Life. Dr Atkins and Griffiths are known in New Zealand for creating and championing the successful $NZ500,00 Second Life Education New Zealand (SLENZ) Project, which over an 18-month period created and established two pilot education programmes, one with Otago Polytechnic in midwifery, and the other in Foundation (Bridging) Learning with Manakau Institute of Technology. The Foundation Learning course, under the leadership of MIT lecturer Merle Lemon (SL: Briarmelle Quintessa), has now become a permanent course within the MIT structure, with a large number of students participating in it. Otago Polytechnic, however, decided at the conclusion of the pilot programme not to take the midwifery course any further. Commenting on the first couple of NMIT classes Griffiths said that although the students had appeared reluctant at first they had quickly realised the potential (of Second Life) “… that it’s more than a game” with the student blogs starting to show their realisation of this. 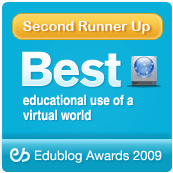 Griffiths and Atkins are detailing the class’ activities in a blog, Immersive 3d environments, which also links into the student blogs: this blog gives an interesting glimpse into how the lessons are constructed and are proceeding as well as student reactions.